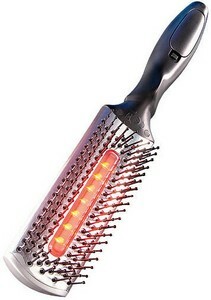 This is the infra red hairbrush for head massaging, hair and scalp stimulation, and err… hot hair. Other than sounding and looking like it’ll cause your hair to combust and your scalp to burn, the IR hairbrush has a purpose that’s twofold. I’m not entirely sure why you’d want to heat your hair up while simultaneously massaging your scalp, but its creators seem to think they’ve found a niche market and are running with it. A heated scalp sounds a little out of the ordinary and all a little dangerous if you ask me – a burnt scalp and the smell of burning flesh will not be pleasant. But the aim of the battery operated brush is to stimulate hair and increase blood circulation to the hair follicles leaving you with a healthy scalp, or a burnt one, whatever. I won’t be the guinea pig.